Divorce is one of the most traumatic experiences a person can go through, whether they’re a spouse or a child of divorcing parents. 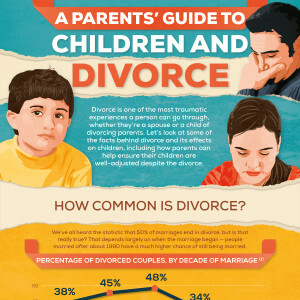 Let’s look at some of the facts behind divorce and its effects on children, including how parents can help ensure their children are well-adjusted despite the divorce. We’ve all heard the statistic that 50% of marriages end in divorce, but is that really true? That depends largely on when the marriage began — people married after about 1990 have a much higher chance of still being married. The likelihood of divorce also varies by where you live. The chances of divorce also increase with each subsequent marriage. While each child and family are unique, divorce has some common effects on children. The negative effects of divorce are most common in the years after the divorce. Sometimes these negative emotional effects can last through adulthood.